The Green Campus Environmental Seminar was co-hosted by the Intl. WeLoveU Foundation and the Daejayon at Seoul Olympic Parktel (Olympia Hall on the first floor) on Monday, March 26. 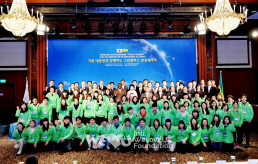 The seminar was organized to raise awareness about global environmental issues and to take action together against climate change; it was attended by the Chairwoman Zahng Gil-jah and the board of directors, 50 managers of its branches inside and outside of Korea, the Daejayon President Kim Yong-gab and officials, and around 200 university students. The Gabonese president, who visited Korea to participate in the 2012 Seoul Nuclear Security Summit, attended this seminar for his first official schedule. From 11:30 a.m. to 1 p.m., he attended the seminar, being accompanied by the Gabonese foreign minister, investment minister, energy minister and deputy minister as well as by Carlos Boungou, Gabon’s ambassador to the Republic of Korea. The seminar proceeded in a friendly atmosphere. When the Gabonese president entered the hall, the WeLoveU Foundation members and university students cheered and clapped to welcome him. The Chairwoman Zahng Gil-jah emphasized the special friendship between Korea and Gabon through her opening address, and expressed her gratitude to the Gabonese president for giving the guests and the university students an opportunity to listen to his precious opinion. She also said that she hoped the WeLoveU Foundation can seek a solution to the global environmental problems and realize a low-carbon society with Gabon that has a lot of concern aout environmental issues. The Korea Sports Promotion Foundation President Jung Jung-taek also hoped that the seminar would be the turning point to globalize the Green Campus Movement. Intl. WeLoveU Foundation Chairwoman Zahng Gil-jah and Gabonese President Ali-Ben Bongo Ondimba hold an agreement on cooperative countermeasures against climate change. The Chairwoman Zahng Gil-jah (left) and the Korea Sports Promotion Foundation President Jung Jung-taek (right) are giving welcoming addresses, and the Gabonese president is delivering a lecture (middle). Through exhibition boards and videos, the Gabonese president watched the effort of the Korean volunteers for the reservation of environment. He thanked for inviting him, and complimented the Foundation on making effort in global environmental campaigns, calling the members the “heroes in charge of the future of Korea.” He added that he wanted to work together and maintain a good relationship with the WeLoveU Foundation. The high-ranking government officials of Gabon also attended the seminar. Next, the Chairwoman Zahng Gil-jah and the President Ali Bongo exchanged a written agreement on cooperation against climate change to the effect that both will make effort to solve global environmental problems. The Chairwoman Zahng Gil-jah and the Gabonese president shared their friendship as she gave an appreciation plaque and gifts to him, and he also gave her gifts from Gabon. All participants posed for a commemorative photograph, the seminar was closed out. The Gabonese president who stayed longer than scheduled impressed Koreans favorably with his amiable smile. The university students who took part in the seminar said, “It is very encouraging that a national leader has interests in the environmental problems and makes echo-friendly policies.” A university student Lee Gyeong-won said, “I feel closer to Africa. I’m convinced that the world can change when the youth of the world share their perception about the environmental problems and make effort together.” The agreement on cooperative countermeasures against the environmental problems between the Intl. WeLoveU Foundation and the Gabonese government will be a meaningful first step toward the better future.